Not to be confused with National Socialism. National syndicalism is an adaptation of syndicalism to suit the social agenda of integral nationalism. National syndicalism developed in France, and then spread to Italy, Spain, and Portugal. French National syndicalism was an adaptation of Georges Sorel's version of revolutionary syndicalism to the monarchist ideology of integral nationalism, as practised by Action Française. Action Française was a French nationalist-monarchist movement led by Charles Maurras. In 1900, Charles Maurras declared in Action Française's newspaper that anti-democratic socialism is the "pure" and correct form of socialism. From then on, he and other members of Action Française (like Jacques Bainville, Jean Rivain, and Georges Valois) interested in Sorel's thought discussed the similarity between the movements in Action Française's conferences and in essays published in the movement’s newspaper, hoping to form a collaboration with revolutionary syndicalists. Such collaboration was formed in 1908 with a group of labor unions' leaders led by Émile Janvion . As a result of this collaboration, Janvion founded the journal Terre libre. The collaboration between the integral nationalism of Action Française and the revolutionary syndicalism of Georges Sorel began in 1909. The connection was formed after Sorel read the second edition of Maurras’ book, Enquête sur la monarchie. Maurras favorably mentioned Sorel and revolutionary syndicalism in the book, and even sent a copy of the new edition to Sorel. Sorel read the book, and in April 1909 wrote a praising letter to Maurras. Three months later, on 10 July, Sorel published in Il Divenire sociale (the leading journal of Italian revolutionary syndicalism), an essay admiring Maurras and Action Française. Sorel based his support on his anti-democratic thought. For example, he claimed that Action Française was the only force capable to fight against democracy. Action Française reprinted the essay in its newspaper on 22 August, titled “Anti-parliamentary Socialists”. In 1910 Sorel and Valois decided to create a national-socialist journal called La cité française. A prospectus for the new journal was published in July 1910, signed by both revolutionary syndicalists (Georges Sorel and Édouard Berth) and Action Française members (Jean Variot, Pierre Gilbert and Georges Valois). La cité française never got off the ground because of Georges Valois’s animosity toward Jean Variot. After the failure of La cité française, Sorel decided to found his own journal. Sorel's biweekly review, called L’Indépendance, was published from March 1911 to July 1913. Its themes were the same as the journal of Action Française, such as nationalism, antisemitism, and a desire to defend the French culture and heritage of ancient Greece and Rome. For more details on this topic, see Cercle Proudhon. During the preparations for launching La Cité française, Sorel encouraged Berth and Valois to work together. In March 1911, Henri Lagrange (a member of Action Française) suggested to Valois that they found an economic and social study group for nationalists. Valois persuaded Lagrange to open the group to non-nationalists who were anti-democratic and syndicalists (Valois wrote later that the aim of the group was to provide "a common platform for nationalists and leftist anti-democrats"). The new political group, called Cercle Proudhon, was founded on 16 December 1911. It included Berth, Valois, Lagrange, the syndicalist Albert Vincent and the royalists Gilbert Maire, René de Marans, André Pascalon, and Marius Riquier. As the name Cercle Proudhon suggests, the group was inspired by Pierre-Joseph Proudhon. It was also inspired by Georges Sorel and Charles Maurras. In January 1912 the journal of Cercle Proudhon was first published, entitled Cahiers du cercle Proudhon. In the early 20th century, nationalists and syndicalists were increasingly influencing each other in Italy. From 1902 to 1910, a number of Italian revolutionary syndicalists including Arturo Labriola, Agostino Lanzillo, Angelo Oliviero Olivetti, Alceste De Ambris, Filippo Corridoni and Sergio Panunzio sought to unify the Italian nationalist cause with the syndicalist cause and had entered into contact with Italian nationalist figures such as Enrico Corradini. These Italian national syndicalists held a common set of principles: the rejection of bourgeois values, democracy, liberalism, Marxism, internationalism, and pacifism while promoting heroism, vitalism, and violence. Many of these national syndicalist proponents would go on to become Fascists. Enrico Corradini promoted a form of national syndicalism that utilized Maurassian nationalism alongside the syndicalism of Georges Sorel. Corradini spoke of the need for a national syndicalist movement that would be able to solve Italy's problems, led by elitist aristocrats and anti-democrats who shared a revolutionary syndicalist commitment to direct action through a willingness to fight. Corradini spoke of Italy as being a "proletarian nation" that needed to pursue imperialism in order to challenge the "plutocratic" nations of France and the United Kingdom. Corradini's views were part of a wider set of perceptions within the right-wing Italian Nationalist Association (ANI) that claimed that Italy's economic backwardness was caused by corruption within its political class, liberalism, and division caused by "ignoble socialism". The ANI held ties and influence amongst conservatives, Catholics, and the business community. With the outbreak of World War I, Sergio Panunzio noted the national solidarity within France and Germany that suddenly arose in response to the war and claimed that should Italy enter the war, the Italian nation would become united and would emerge from the war as a new nation in a "Fascio nazionale" (national union) that would be led by an aristocracy of warrior-producers that would unite Italians of all classes, factions, and regions into a disciplined socialism. In November 1918, Mussolini defined national syndicalism as a doctrine that would unite economic classes into a program of national development and growth. National syndicalism in the Iberian Peninsula is a political theory very different from the fascist idea of corporatism, inspired by Integralism and the Action Française (for a French parallel, see Cercle Proudhon). It was formulated in Spain by Ramiro Ledesma Ramos in a manifesto published in his periodical La Conquista del Estado on 14 March 1931. National syndicalism was intended to win over the anarcho-syndicalist Confederación Nacional del Trabajo (CNT) to a corporatist nationalism. Ledesma's manifesto was discussed in the CNT congress of 1931. However, the National Syndicalist movement effectively emerged as a separate political tendency. Later the same year, Juntas de Ofensiva Nacional-Sindicalista was formed, and subsequently voluntarily fused with Falange Española. 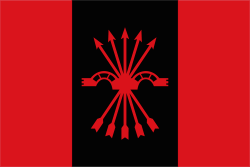 In 1936 Franco forced a further less voluntary merger with traditionalist Carlism, to create a single party on the Nationalist side of the Spanish Civil War. It was one of the ideological bases of Francoist Spain, especially in the early years. The ideology was present in Portugal with the Movimento Nacional-Sindicalista (active in the early 1930s), its leader Francisco Rolão Preto being a collaborator of Falange ideologue José Antonio Primo de Rivera. The Spanish version theory has influenced the Kataeb Party in Lebanon and various Falangist groups in Latin America. The Unidad Falangista Montañesa maintains a trade union wing, called the Association of National-Syndicalist Workers. Sternhell, Zeev (1984). La droite révolutionnaire, 1885-1914: les origines françaises du fascisme. Paris: Éditions du Seuil. ISBN 978-2-02-006694-5. Mazgaj, Paul (1979). The Action française and Revolutionary Syndicalism. Chapel Hill: University of North Carolina Press. ISBN 978-0-8078-1316-4. ↑ “A vigorous protest had to be made against this spirit of decadence: no other group except Action française was able to fulfill a role requiring both literacy and faith. The friends of Maurras form an audacious avant-garde engaged in a fight to the finish against the boors who have corrupted everything they have touched in our country. The merit of these young people will appear great in history, for we may hope that due to them the reign of stupidity will come to an end some day near at hand”. Originally published in Sorel, Georges (22 August 1909). "Socialistes antiparlementaires". L’Action française. Quoted in Sternhell, Zeev; Sznajder, Mario; Ashéri, Maia (1995). The birth of fascist ideology: from cultural rebellion to political revolution (Third printing, and first paperback printing ed.). Princeton, New Jersey: Princeton University Press. p. 79. ISBN 0-691-03289-0. ↑ Quoted in Sternhell, Zeev (1986). Neither right nor left: fascist ideology in France. Princeton, New Jersey, USA: Princeton University Press. p. 11. ISBN 978-0-691-00629-1. ↑ Douglas, Allen (1992). From fascism to libertarian communism: Georges Valois against the Third Republic. Berkeley and Los Angeles: University of California Press. p. 29. ISBN 978-0-520-07678-5. ↑ Zeev Sternhell, Mario Sznajder, Maia Ashéri. The birth of fascist ideology: from cultural rebellion to political revolution. Princeton University Press, 1994. Pp. 161. ↑ Zeev Sternhell, Mario Sznajder, Maia Ashéri. The birth of fascist ideology: from cultural rebellion to political revolution. Princeton University Press, 1994. Pp. 31-32. ↑ Zeev Sternhell, Mario Sznajder, Maia Ashéri. The birth of fascist ideology: from cultural rebellion to political revolution. Princeton University Press, 1994. Pp. 32. ↑ Zeev Sternhell, Mario Sznajder, Maia Ashéri. The birth of fascist ideology: from cultural rebellion to political revolution. Princeton University Press, 1994. Pp. 33. 1 2 Zeev Sternhell, Mario Sznajder, Maia Ashéri. The birth of fascist ideology: from cultural rebellion to political revolution. Princeton University Press, 1994. Pp. 163. 1 2 3 Martin Blinkhorn. Mussolini and fascist Italy. Second edition. New York, New York, USA: Routledge, 2003 Pp. 9. ↑ Anthony James Gregor. Mussolini's intellectuals: fascist social and political thought. Princeton, New Jersey, USA: Princeton University Press, 2005. Pp. 78. ↑ Anthony James Gregor. Mussolini's intellectuals: fascist social and political thought. Princeton, New Jersey, USA: Princeton University Press, 2005. Pp. 81. Sternhell, Zeev; Sznajder, Mario; Ashéri, Maia (1995). The birth of fascist ideology: from cultural rebellion to political revolution (Third printing, and first paperback printing ed.). Princeton, New Jersey: Princeton University Press. ISBN 0-691-03289-0. Sternhell, Zeev (1986). Neither right nor left: fascist ideology in France (2nd ed.). Princeton, New Jersey: Princeton University Press. ISBN 978-0-691-00629-1.